One of the first things that our son Lachlan did upon learning that we were moving to Lausanne, Switzerland was to get on the internet in order to find out if there were any football teams that he could play for. Having recently developed a passion for the game in Toronto, he wanted to make sure he could continue to play football in Europe. Much to his surprise (and to our great relief), he quickly learned that football has an active presence here, with dozens of clubs and several leagues operating at a regional and national level. Now, by “football” I mean the North American game in which helmeted players bash heads and bodies while trying to move a ball up and down the field. Here in Europe, of course, the term “football” is reserved for the game that we North Americans call “soccer.” To avoid confusion, Europeans call the North American game “American football”. However, since this is a post about Lachlan, for whom “football” means football and NOT soccer, and is intended for a largely North American audience, let’s just call it football. 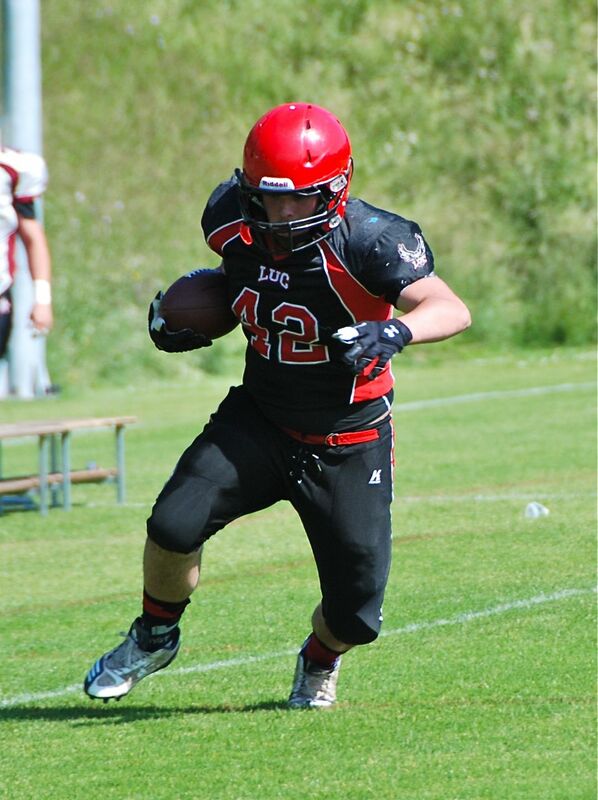 Lachlan rushing the ball in a game against the Lugano Lakers. Before getting into the subject of football in Switzerland, let’s rewind the tape a little. Lachlan got his first taste of football while a grade 9 student at Northern Secondary School, which has one of the best high school football programmes in Toronto, if not all of Canada. While, as a rookie, he didn’t see much playing time, and lost the last half of the season to an ankle injury, he was totally hooked on the sport. As he said to me after practicing with the team for a couple of weeks: “I finally found the sport that suits my body type.” For anyone who has seen Lachlan, the kid was BORN to play football! 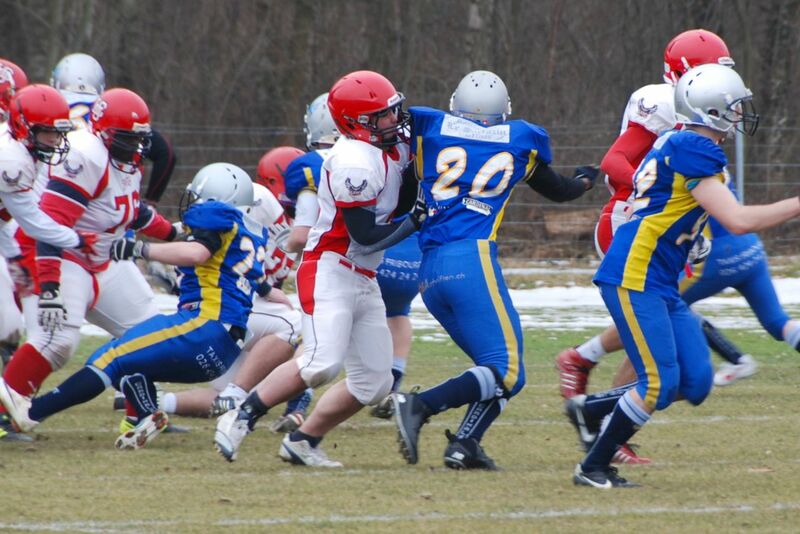 Lachlan manhandles a Fribourg defender. In the spring of 2012 Lachlan joined the ranks of the Toronto Junior Argos football club, where he quickly broke into the starting line-up as a Right Guard on the offensive line. The Junior Argos enjoyed a successful season, finishing 5th in their division and making it all the way to the Ontario Football Conference semi-finals. With Lachlan’s love for football only growing deeper, the move to Switzerland in the summer of 2012 was difficult. We were all concerned about whether or not he would be able to continue to pursue his passion. 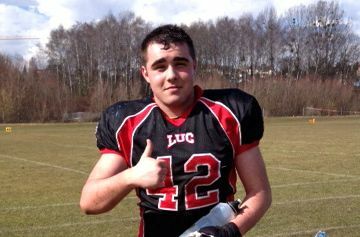 Fortunately, shortly before moving we made contact with the coach of a football club in Lausanne – the Lausanne University Club of American Football (LUCAF) – who welcomed Lachlan to the team. 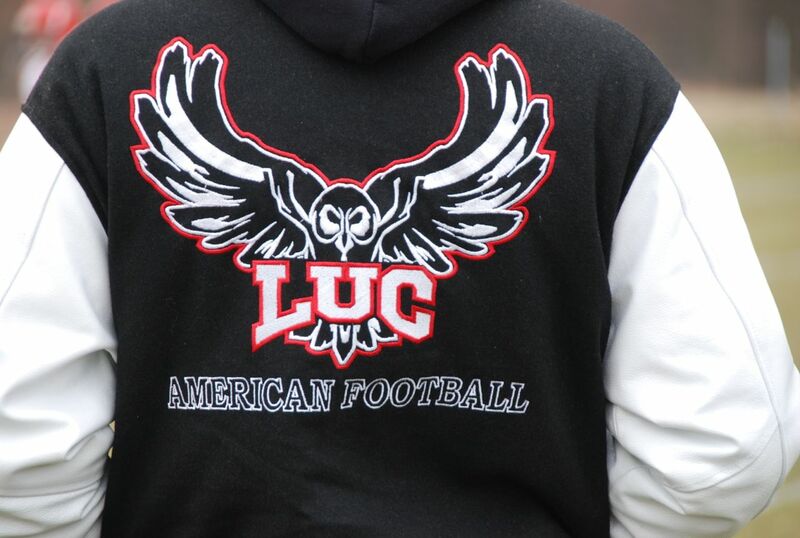 Affiliated with the University of Lausanne, LUCAF fields junior and senior tackle football teams that compete in regional and national level leagues, and there is plenty of competition in the area, with teams in Geneva, Yverdon, Fribourg, Neuchatel, Basel, Thun, Lucerne, Berne, and Zurich, to name a few. While definitely a niche sport here in Switzerland, where “soccer” is by far the most popular sport, it is slowly gaining in popularity. The Swiss seem quite fond of North American contact sports and are huge fans of ice hockey, so the growth prospects for football seem good. Post-game debriefing with coaches Pat (“Patate”) and Sven. Within 2 weeks of arriving in Switzerland Lachlan was suiting up for training with his new team. While he had spent the previous season playing as an offensive lineman, Lachlan spent the fall of 2012 transforming himself into a LUCAF running back. The team had an opening for a full back, whose job it is to carry the ball while more or less acting like a battering ram, ploughing through the defense on short yardage plays. At 5′ 9″ and 215 lbs, Lachlan was the perfect man for the job. The LUCAF Juniors practiced a couple of days per week throughout the fall and winter, with the official competitive season starting in April 2013. By LUCAF’s own standards and past record, the season was a disappointment, with the team finishing the season with a record of 3 wins and 5 losses. While the season began on a positive note with a couple of relatively easy wins, the guys encountered some very tough teams from Lucerne, Thun, Geneva and Lugano. Starting with a relatively small roster to begin with, the ranks of the team were thinned out by injuries towards the end of the season as well. Judging by his own individual stats, however, Lachlan had a solid first season in the fullback position. First of all, he scored 3 touchdowns, the most tangible contribution an offensive player can make. Breaking down his stats further, he completed a total of 44 carries in 7 games, racking up 169 total yards and averaging just under 4 yards per carry. He also completed 4 receptions for 18 yards. With stats like these, it was clear that Lachlan was seen and used as a go-to ball carrier in situations where the team needed a safe few yards. The season was a success by other measures as well. With away games in cities like Geneva, Basel and Lugano, Lachlan had a good chance to visit some other parts of Switzerland and see the countryside from the window of the team bus. 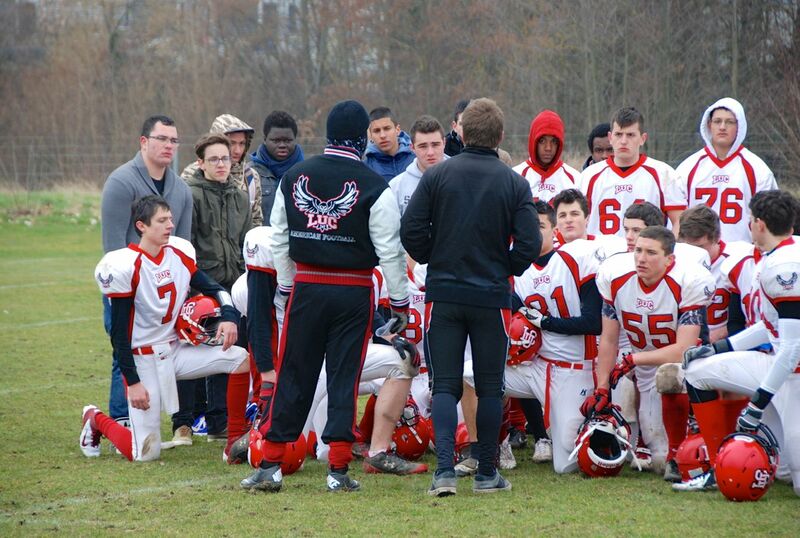 In addition, the LUCAF team and coaching staff is made up of local French-speaking Swiss guys, so the business of practice and games is conducted almost entirely in French (with the exception of the use of English technical terms from the game like “yard” and “touchdown”). Thus, at least a couple of times each week Lachlan had an opportunity to use and improve his conversational French. While it took a little while, he eventually got to know the guys and now counts a number of them among his friends here. Lachlan (centre) in his happy place. As I write, another season is well under way. The guys have been practicing since August. The older members of the team are currently playing in a fall regional league, for which players have to be at least 17. Lachlan tried (unsuccessfully) to get us to change the date on his birth certificate. He is chomping at the bit to get back into the game. Stay tuned for news from the spring 2014 season!